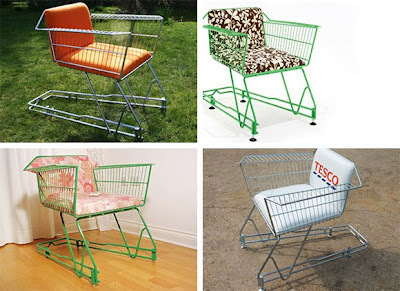 The "Annie the shopping trolley" Chair by Max McMurdo for Reestore. To make your own all you need is a stolen (recycled) shopping cart, a blowtorch, some fabric, and a little bit of creativity. Looks like there's a new product for homeless people to make money on, can you say Derelllliiiiict?